The day had finally arrived! 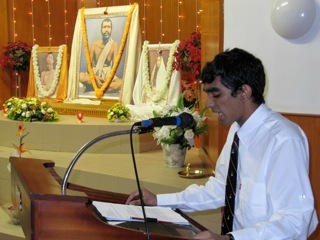 We, the youth members were just awaiting the commemoration of the 147th Birth Anniversary of Swami Vivekananda at the Pietermaritzburg Sub-Centre, held on 5 February 2010. This is one of the most important functions on our Religious calendar as the philosophy of Swami Vivekananda and the ideals for which he lived and worked continue to be a great source of inspiration for the Youth. He will be ever remembered as one of the main architects of the modern world for he brought about a new understanding of Vedanta and bridged the gap between east and west. Accordingly, the youth were eagerly gathered in the shrine and great anticipation was in the air as this function was exclusively planned, co-ordinated and managed by the Youth of the Sub-Centre. 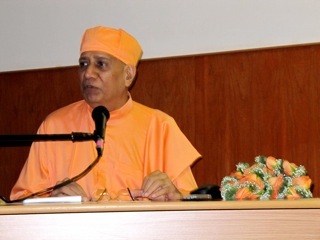 The programme commenced promptly at 19:00 hrs and the devotees were warmly greeted by sister Karistha Singh who was the Programme Director for the evening. 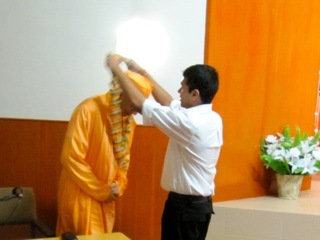 After the initial proceedings, brother Akshar Sewrathan extended a cordial welcome to His Holiness Swami Vimokshanandaji Maharaj by garlanding him. Earlier at the entrance two sisters placed the holy tilak on his forehead in the traditional style. The first speaker for the evening was sister Sonal Sewrathan, who addressed the congregation on the topic “You are the Creator of Your Own Destiny”. Sister Sonal related the parable of a Pencil Maker, highlighting the fact that we are all created by the Maker who is God, to follow our own destiny by either beautifully designing it OR misshaping it with our thoughts, words and deeds. Watch your thoughts; they become your words. Watch your words; they become your actions. Watch your actions; they become your habits. Watch your habits; they become your character. Watch your character for it will become your destiny. 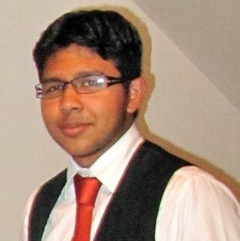 The second speaker was brother Yashvir Rugbeer, who presented a paper entitled “The Importance of Youth in Society”. He reminded the youth of their role in society. Quoting Sri Swami Vivekananda extensively he emphasised that the sole responsibility of the youth of today rested on the present so that they can suitably mould the future, as it depended only on the efforts of their hands. He added that their values, determination and character ultimately decide the preservation of our world. Brother Yashvir pointed out also the fact that youth are completely entangled in the superficial world and do not realise the gravity of their actions, primarily due to their ignorance. He highlighted that the essence of true success is what ‘you make of yourself’. ‘It is the conduct of life that you develop, it is the character that you cultivate and it is the type of person that you become.’ He advised the youth to equip themselves with the necessary skills in order to ensure a bright future as success was not measured in terms of what one obtained but in terms of what one could become, how one lived and what actions one performed. 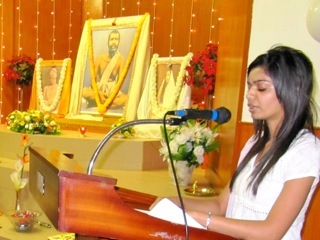 The youth were then treated to a soul stirring rendition of “Ham Honge Kamayab” bhajan led by sister Revathi. Helping those who are trying to be and to do good. 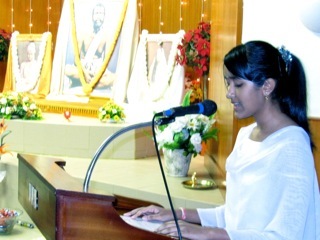 Finally, sister Karistha invited Sri Swami Vimokshanandaji Maharaj to address the youth. Swamiji is the embodiment of love, compassion and humility and the youth of the Centre were extremely blessed to be in his holy company. Everyone waited with bated breath in order to imbibe the sacred message that Swamiji Maharaj was about to deliver. However, true to form, Swamiji surprised us and introduced an impromptu “Question and Answer” session. 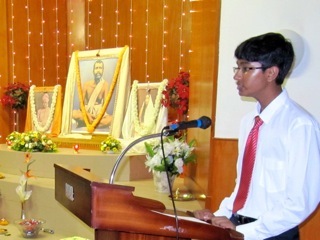 Swamiji encouraged the youth to “be bold” and put forward questions on the papers that were delivered that evening. Discussions centred around the many temptations that the youth are currently faced with, the social evils of electronic media, disciplining of the youth and overcoming injustices faced by the youth. Swamiji astutely handled all the questions posed by the congregation, offering sound advice based on the teaching of the holy scriptures and also as taught by the lives of the three Divinities, in terms of implementation in our daily lives. Sadly due to time constraints, the question and answer session had to come to an end. After the performance of arati and concluding Vedic prayers, it was my proud turn to proceed to pass the vote of thanks. Three of our youth members, sisters Kajal, Shriyanthi and Kamiksha presented a gift basket to Swamiji as a token of our appreciation. This was truly an inspiring evening. 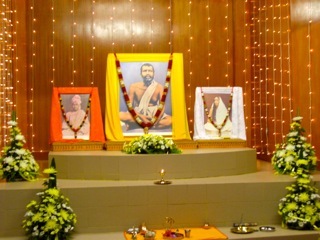 This was echoed by one of the devotees, who described the evening as “one of the best functions so far”. The youth offered their pranams to Revered Maharaj, and thereafter partook of prasad, in the form of supper. Thus concluded an evening of spiritual enlightenment. Everyone present can safely say that they were stimulated and entertained by the thought provoking programme. It provided the youth an opportunity to showcase their knowledge, talents and ideas and it was this that made the event a fitting tribute to the teachings of great Swami Vivekananda. Wishing I was also there ! Please accept my warm regards! Indeed the Report is well written! It is so wonderful to see such talented youth in this country, who have taken Swamiji as naturally as given. The program went off very well. Sitting there I was thinking I should have brought some books at least as my gift to these youth. But in a hurry, I just forgot when I left Durban. But Mother had already arranged it! One senior devotee Sundeep Singh there informed me that he had with him five copies of A Primer of Hinduism by D S Sharma just got from India and asked me, would I like to give them away to the five participants! Lo! I was so happy that Mother really takes care of us. When are you planning to visit SA? Wonderful is Mother’s play, and how could She let your Shiva samkalpa go unfulfilled? Personally, I have come to feel that in Swamiji is the panacea for all our ills, whatever our age, gender, religion or, for that matter, our beliefs. As Sister Nivedita once said, Sri Ramakrishna is the crystallisation of the 3000 years past, and Swamiji, of the 3000 to come. I would certainly love to visit SA Rev Maharaj, but the Lord knows when! Also, it is a fervent hope that we will have the great privilege of having your darshan here at Delhi sometime soon. Avthar’s detailed account of our Youth Meeting is remarkable. A grade 7 pupil with so much zest, thirst for the knowledge and enthusiasm for life is a role model for our tIny tots and many youth. In this connection, I must appreciate the care and attention that his parents give out in rearing him and his sister in a spiritual way is noteworthy. May I take this opportunity of expressing my gratefulness to Swamijee for asking Avthar to do the write-up? For bringing out ONLY THE BEST IN OUR CHILDREN AND INSPIRING THEM TO FOLLOW THE TEACHINGS OF SWAMI VIVEKANANDA. a hearty THANK YOU!